I worked half a day today, which turned out to be a very busy half day at work. I ended up finally getting underway about 2 PM. I had a pleasant drive down I-5 for about 296 miles to Ashland. My plan from the start was to spend the night in Ashland. It was raining lightly in Beaverton when I left but cleared up as I went south and it was even in the high 60's outside when I reached Ashland. No pictures this day since I was just interested in driving south. Upon waking up this morning I was surprised to discover that the nice weather had disappeared, it was raining off and on and I could see fresh snow low on the hills. Since today was the day that I was suppose to pick up my buddy Rusty at the Reno airport at 6:30 PM, and Reno was only about five hours away, I took my time leaving town, think sleep late and eat big breakfast. By the time I headed south it had started snowing lightly so I was wondering if the Siskiyou Pass would have snow on the road, but it turned out to just have some light blowing snow when I reached the summit. I turned off of I-5 at Mt Shasta and headed southeast on Hwy 89 towards Susanville where I connected with Hwy 395 south headed towards Reno. It was a relaxed drive and went faster than I expected. The end result was that I was in Reno about 3:30 PM and Rusty's flight was not due in until 6:30 PM. After wasting some time around town I ended up waiting in the airport's cell phone waiting parking area reading a book until Rusty's plane finally landed, about a half hour late. Note that I had planned on parking in their short term parking lot and waiting in the terminal but the height restriction on their short term parking was 7' 7" and with the box on top of the car I need a full 8'. Since Lake Tahoe was so close to Reno, about 34 miles, we had previously decided we would drive up to Incline Village on the north end of the lake to find a place to stay. It was dark when we reached the village but we had no problem finding a hotel. However, we did not have a reservation and it turned out they were full, but Rusty saved the day by talking the front desk into cleaning up a room they had under renovation that was on one of their Club Regency floors and they gave it to us at a very reasonable rate. It took about an hour and a half for them to get the room ready so we had some drinks and dinner at the bar while we waited. I should have stopped and taken some photos today given how much spare time I had, but the weather was less than ideal and the drive so relaxing that before I knew it I was in Reno. We awoke early this morning and after a very nice continental breakfast, included in our room rate, in the "special and exclusive" Club Regency room, we headed south along the east shore of Lake Tahoe. 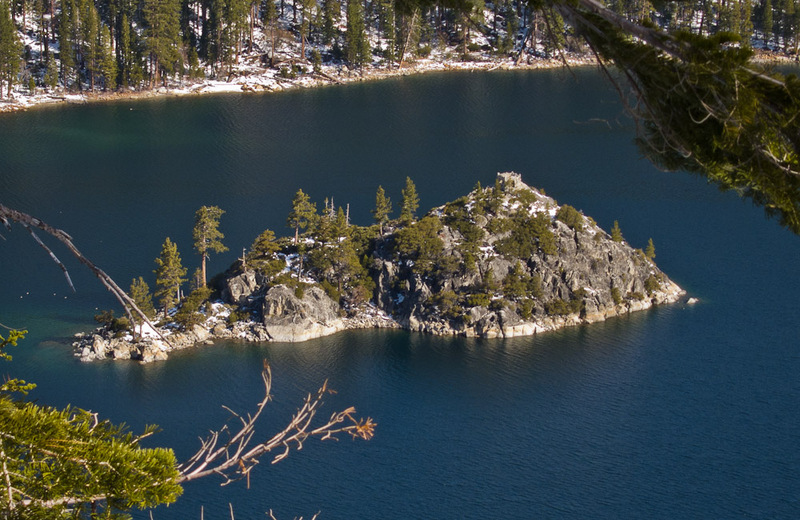 We took a side trip around the southern end of the lake to visit Emerald Bay. Rusty has memories of the place from when he was a kid. 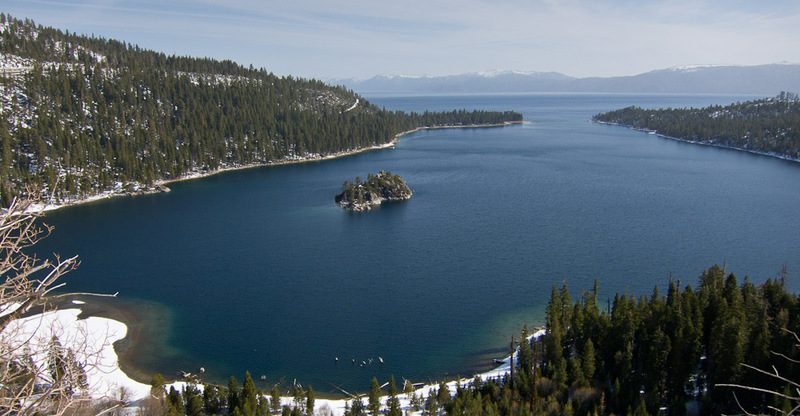 The following two images of Emerald Bay are from Rusty. While taking this first photo we were stopped in a area that said "no stopping due to avalanche danger". Below is a close up of Fannette Island, also shown above, in the middle of the bay with Mrs. Knights Tea House on top. Rusty says that when he was younger he swam out to this island. While taking the photo below we were stopped at a closed overlook that had so much snow that it covered most of the benches. After visiting Emerald Bay we headed back east on Hwy 207 to Hwy 395. Then south to Mono Lake. We had originally planned on visiting Bodie on our way south but prior to the trip we had discovered that the roads to Bodie are closed in the winter, a fact we confirmed on our way south. We tried two different routes into Bodie but ran into both roads being closed long before reaching Bodie. We stopped briefly at Mono Lake and hiked to the shore and back, but did not spend much time there, partly because it was cold and partly because the mid-day light was not very interesting. The most interesting part of the drive south was all the snow along road. While the road itself was clear, much of the road was at 7000 to 8000 feet with lots of snow along the side and all the hills. We stopped in Bishop, CA and had lunch at the Whiskey Creek restaurant and then visited the Mountain Light Gallery, also known as Galen Rowell's gallery. Finally we arrived in the late afternoon in Big Pine, CA which is where we planned to spend the night before heading into Death Valley. We spent some time figuring out where the start to Death Valley road is, purchased gas and stocked up on some provisions since our plan is to camp tomorrow night at Eureka Dunes. We had originally assumed that all 45 miles into Eureka Dunes would be a gravel/dirt road but according to the sign at the start of the road the first 25 miles is paved. If we had known this we might have tried to get down here in time to make it in today, but it was too late to start this afternoon since we are not familiar with the area. After spending most of the day at high elevations, 7000 feet +/- a 1000 feet, with temperatures in the low 30's it was very pleasant to be in Big Pine, about 4000 feet of elevation, with a temperature of 71 degree. 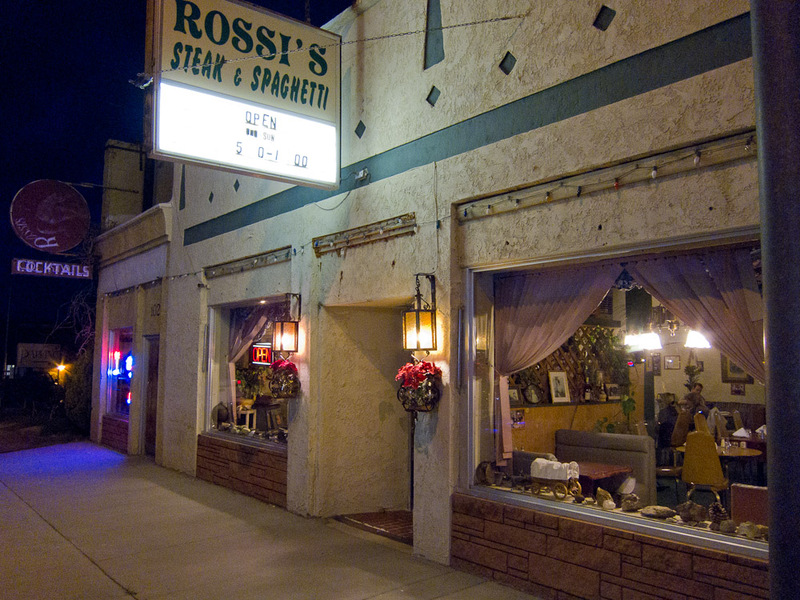 After hanging out in the motel for a while, writing this journal, etc, based upon a couple recommendations we went to dinner at Rossi's just across the street. It turned out to be a very cool place to eat. 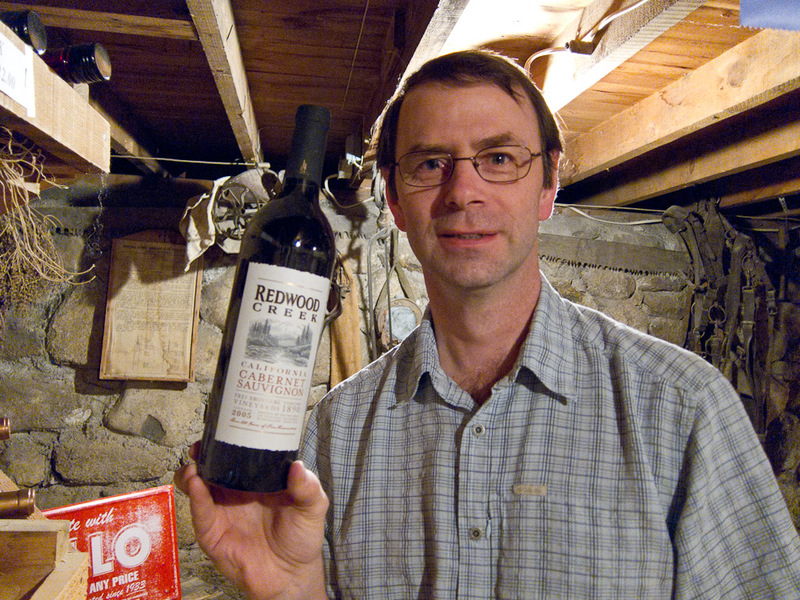 The first coolness was the old guy in suspenders playing the old and somewhat out of tune piano, but the best part was that to order our wine the technique was for us to walk down into the basement to their wine cellar and bring up the wine we want, see photos below (credit goes to Rusty for all these photos, except the one I took of him with his camera). The food was very good. 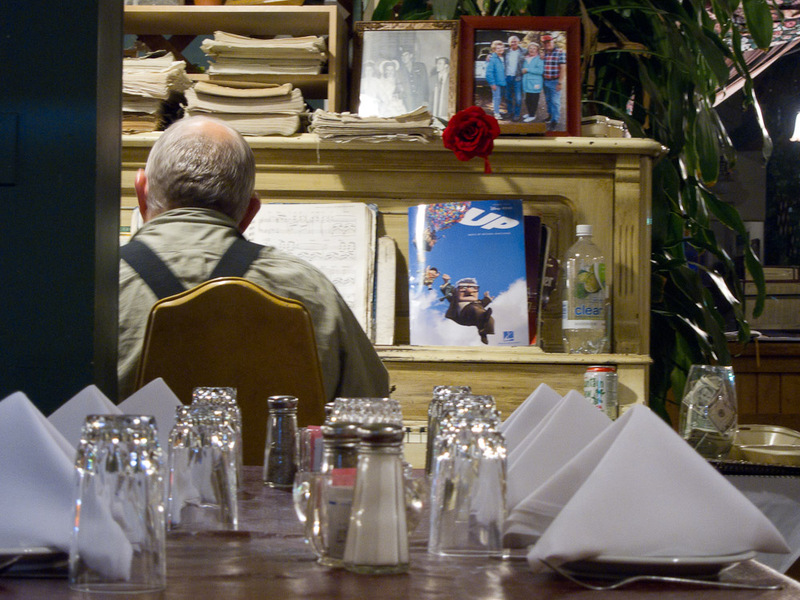 Here's the old guy playing the piano. 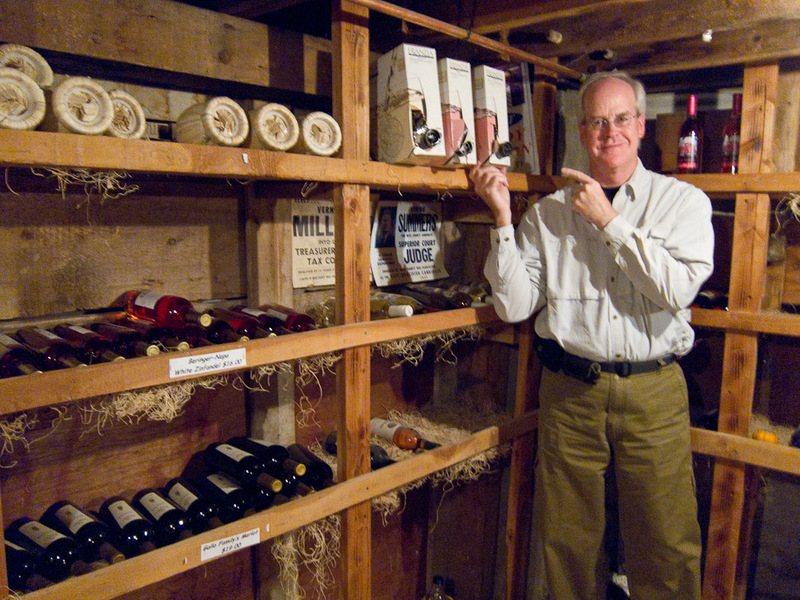 They had a range of selections in their cellar. But below is what we finally selected from the choices available and it turned out to be nice. 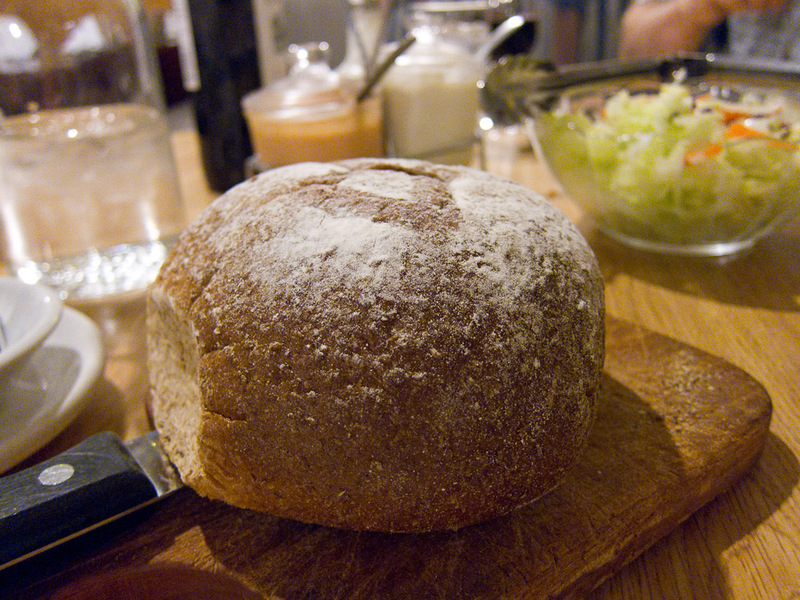 Below is the fresh baked bread we were served with dinner. 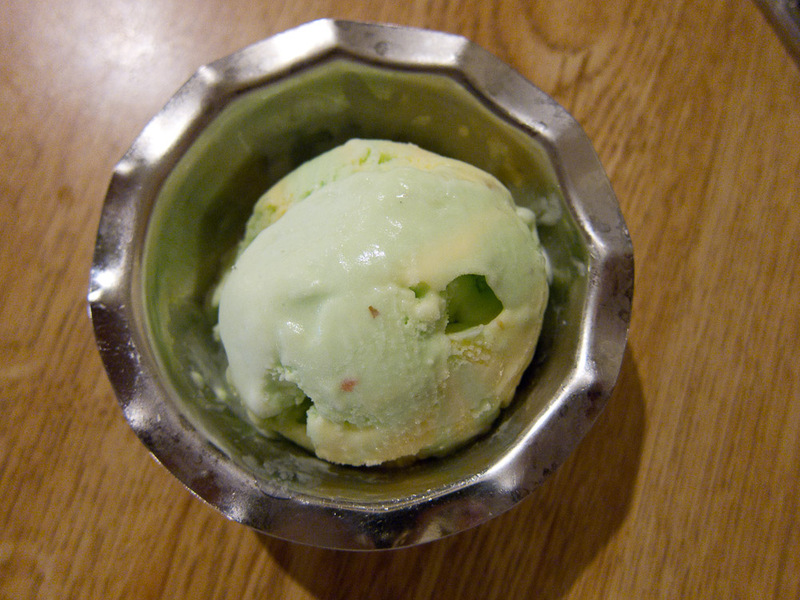 A nice touch to the meal was that it came with a bowl of spumoni for dessert. 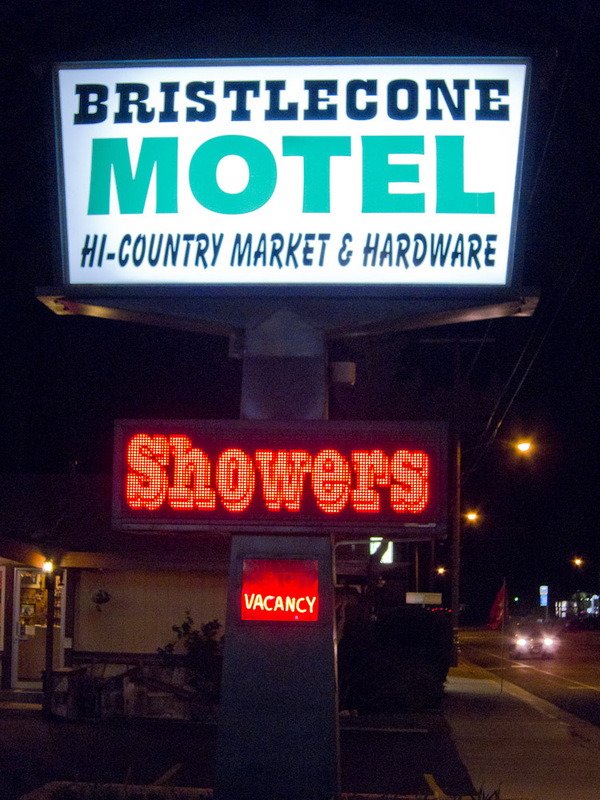 Here is a picture of the motel's sign that Rusty took on our way back across the street from Rossi's. The motel office lady told us it snowed here on Monday, which is apparently unusual. Our main concern now is that the weather forecast we have been looking at is calling for wind in Death Valley, 15, 20 or 25 mph. This could cause us two significant problems. First, if the wind happens on the few nights that we will be camping I do not think my large car camping tent will work that well. Second, the wind is likely to cause a lot of blowing sand which is not good for the photography we had planned, we may have to be creative and figure out how to photograph a windy Death Valley. Note that I do not know when my next internet connection will be so it could be a while before I can post updates to this journal.